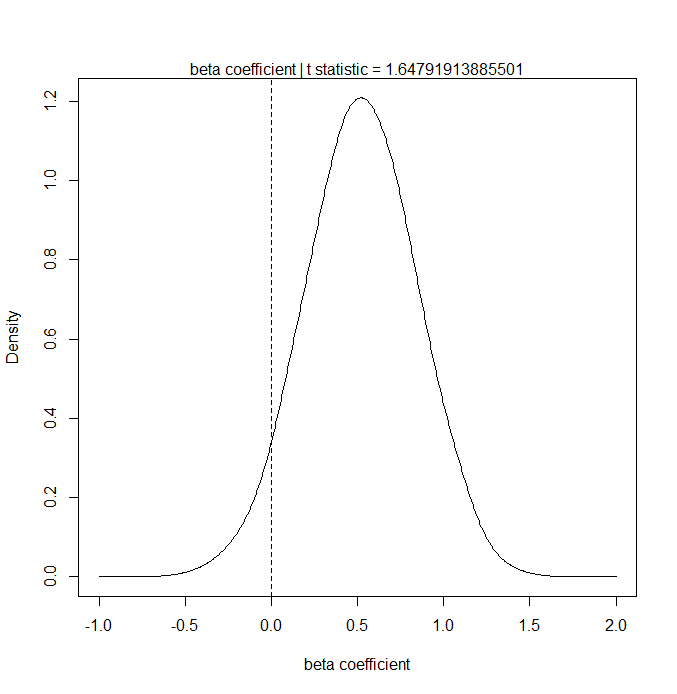 for a null hypothesis that beta is zero or negative. I argued that (despite our long pedagogical practice) there are, in fact, many situations where this interpretation of the p-value is actually the correct one (or at least close: it’s our rational belief about this probability, given the observed evidence). , and then sliding the entire distribution to the left adding up the area swept under the likelihood by that line). As I also explained in the earlier post, everything about my training and teaching experience tells me that this way lies madness. But despite the apparent unorthodoxy of the statement–that the p-value really is the probability that the null hypothesis is true, at least under some circumstances–this is a well-known and non-controversial result (see Greenland and Poole’s 2013 article in Epidemiology). Even better, it is easily verified with a simple R simulation. The trouble, at least from where I stand, is that I wouldn’t want to substitute one falsehood (that the p-value is never equal to the probability that the null hypothesis is true) for another (that the p-value is always a great estimate of the probability that the null hypothesis is true). What am I supposed to tell my students? The null hypothesis is an interval, not a point null. One-tailed alternative hypotheses (implying one-tailed nulls) are the most obvious candidates for this interpretation. Whatever other assumptions are needed to sustain the validity of parameters estimated by the model. This just says that if we’re going to talk about the probability that the null hypothesis about a parameter is true, we have to have a belief that this parameter is a valid estimator of some aspect of the DGP. We might classify the Classical Linear Normal Regression Model assumptions underlying OLS linear models under this rubric. lies anywhere between -2 and 2. 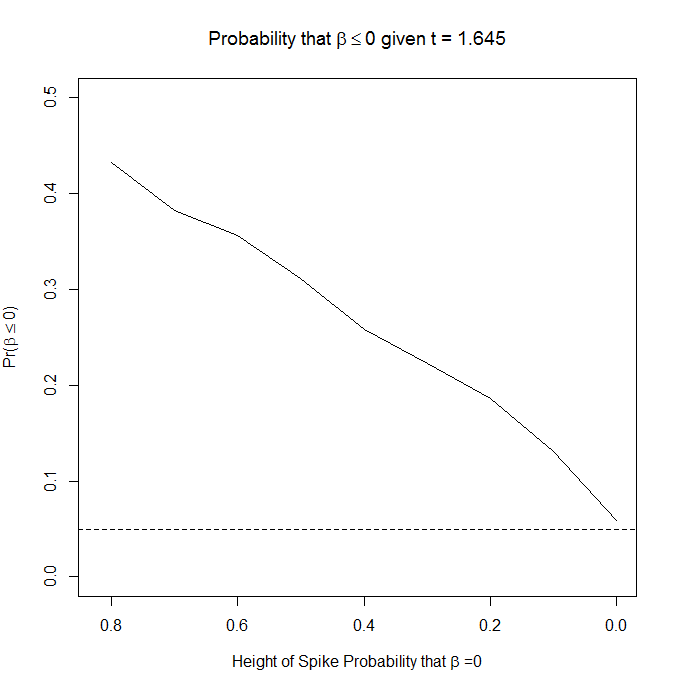 I vary the height of the spike between 0 and 0.8.
, the theoretical expectation). The distance between the solid and dotted line is the “bias” in the estimate of the probability that the null hypothesis is true; the p-value is almost always extremely overconfident. That is, seeing a p-value of 0.05 and concluding that there was a 5% chance that the null was true would substantially underestimate the true probability that there was no relationship between x and y.
values with a normal distribution, where we center each distribution on zero but vary its standard deviation from wide to narrow.
. But as the distribution becomes more and more diffuse, the p-value becomes a reasonably accurate approximation of the probability that the null is true. In conclusion, it may be more productive to focus on explaining the situations in which we expect a p-value to actually be the probability that the null hypothesis is true, and situations where we would not expect this to be the case. Furthermore, we could tell people that, when p-values are wrong, we expect them to underestimate the probability that the null hypothesis is true. 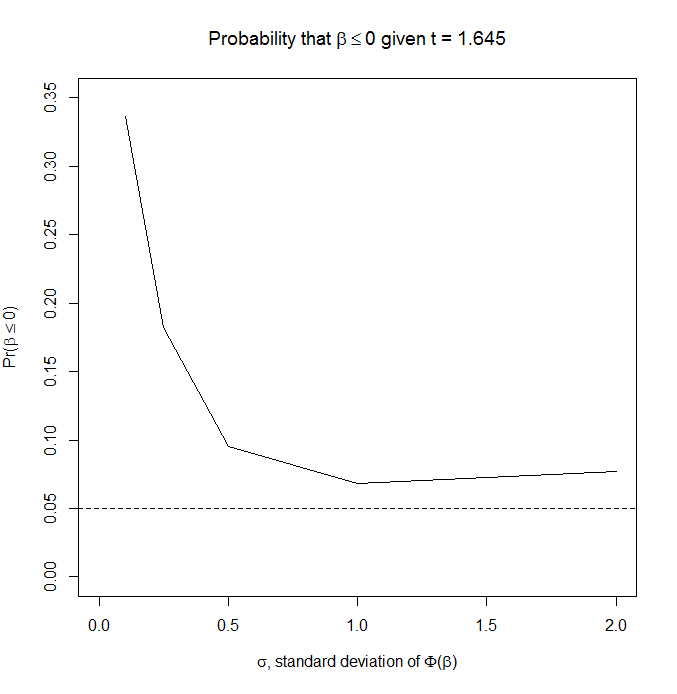 That is, when the p-value is 0.05, the probability that the null hypothesis is true is probably larger than 5%. Isn’t that at least as useful (and a lot easier) than trying to explain the difference between a sampling distribution and a posterior probability density?